When you have a child, you have a responsibility to introduce him or her to a wide range of people and experiences to better prepare them for the world. The same is true when you have a puppy or a dog. This process is known as socialization. Let’s look at some of the reasons why this process is so important and how you can be sure to properly socialize your canine companion. If you’ve seen aggressive dogs before, you’ve also seen the consequences of poor socialization. When dogs haven’t been introduced to these new experiences, they become fearful and anxious when encountering them. Just think of how you felt on the very first day you ever worked at a job or the first day you went to school. Socialization, therefore, helps make dogs more comfortable when they have these experiences, such as meeting a new dog at the pet store or being petted by children or riding in the car. Positive early experiences are the best way to prevent future anxiety and aggression problems in your dog. Another good thing about socialization is it helps you meet new people and have new experiences. Taking your dog to the park, for example, is a great way to start up conversations with people if you are normally a shy person. Obviously, the best time to start is when the puppy is very young. Take him or her with you whenever you can, and let people approach and pet him. Take him to the puppy education classes of your local pet shop where he will interact with other puppies. Take him to the small dog area of your local dog park. See how he reacts, how he acts, and get to know him well. If you adopted an adult dog, hopefully he will have been exposed to other people and dogs in positive situations, but you still have to see for yourself how he reacts around people and animals. The most important part of the socialization process is the positive experience. If you take your dog to the dog park for the first time and the experience is horrible, she is going to be more reluctant to return the second time. She may be fearful or anxious which could lead to another bad experience. Before you know it, the dog park is off limits. You obviously don't want that to happen. So, take her at a time when there are not a lot of dogs around. Don't bring her in with the leash on. By now you should know how she reacts to other dogs she might have encountered on her walks. If she tends to be aggressive, you might need to do some training before exposing her to a large dog park. How can you guarantee a positive experience? Remove your own fear and nervousness about the situation. If you’re nervous, your dog will be, too. Always be positive and assume that the experience is going to go well. Another way to do it is taking him to the pet shop, where she or he will probably encounter other dogs. When you go to the pet store, keep your dog on leash at all times (and do not use extendable leashes) and pay attention to his or her behavior. A dog that starts acting nervous or becomes very alert needs to be corrected immediately. If your dog becomes nervous under certain circumstances, it’s a good idea to calmly make him or her confront what is causing the nervousness... unless it is a real threat. If you’re walking your dog on the sidewalk and a city bus drives by and startles your dog, the next time a bus comes, make him sit instead of letting him hide from it. Have him sit until the bus passes and then praise him like crazy. Now, if an unleashed, threatening dog were approaching you, this would require a different tactic and would not be the best time to confront the problem. The important thing is to have your dog encounter as many new experiences and people as possible. Walk him or her in different locations: your neighborhood, the park, the river, around shopping areas that permit dogs, near roads, around noisy areas, and around quiet areas. 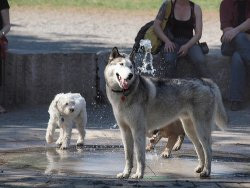 You also want your dog to interact with other animals and people, including people of all types and ages. Make sure your dog is also socialized to lots of experiences, including riding in the car, having his feet touched, being groomed, getting a bath, being petted, and more. The bottom line is that thorough socialization does take time and commitment from you, but the results are well worth the effort.